Home » Blog » Is Responsible Food Really More Expensive? Yesterday, I did my weekly grocery shopping at our local farmer’s market. I shared the results of my shopping trip with my online social community, and while the result was generally positive, there was also a clear indication that the assumption out there is that this choice, to purchase my groceries from local, sustainable and humane sources, must have been expensive. Well, if there is one thing I am truly devoted to in 2014, its questioning assumptions. Happy cows from Polyface Farm. Confronted with this meme, I looked back to the source of my decision to go local and sustainable in the first place. That move certainly came from the culmination of a lifetime of learning and exploration, but one of the most powerful moments along that journey was the viewing of the documentary Food Inc. I cannot fully express in a simple article the depth and insight of this film, but I can give you a sampling of the ideas that emerge from it. I hope that this sampler will whet your appetite for more, and that you will watch the film and continue forward to do your own investigation into the true costs of our current food culture.First of all, in most consumer’s minds, is the dollar value or cost of the groceries. It should not be assumed that humanely and sustainably raised food will have a big hit on the pocketbook. Many local producers, especially at farmer’s markets or through CSAs offer pretty reasonable prices. According to many studies, local seasonal vegetables can frequently be less expensive than the regular conventional options from the chain stores. Additionally, local and sustainable meat is usually offered at a very fair rate per pound and the price per pound can go down significantly by purchasing a whole animal. This might require more storage space and creativity in meal planning, but, to my mind, the results are well worth that added cost. These added benefits include knowing that your choices support the health of your family, your community, and the environment. I truly believe that these values should be weighed as true benefits in this equation. On the other side of the equation, I don’t believe that the average consumer is recognizing the true cost of choosing conventional food. certainly, the system has created this possibility by not factoring the true cost of industrial food production into the bottom line price paid by the consumer. It is these added hidden costs of our industrial agricultural system which are so well defined in Food Inc. and which drive my personal choices today. First on the list for me is the cost to the environment. Our mega farms and meat production are doing incalculable damage to our environment. Monoculture disrupts the balances of the natural world and is upsetting populations of animals from bees and song birds to our keystone predators. Petroleum based fertilizer helps sustain the petrochemical industrial complex, contributing to massive global pollution, and directly polluting the local soil and water with unnatural and unprecedented amounts of nitrogen. The tight population density of our domesticated animal production also concentrates the waste products of these animals, again causing pollution and a disruption of ecological balance. This is just to briefly, incredibly briefly, name just a few of the environmental impacts of the common way that we produce food in this country. The dangers of our industrial agriculture include the risks of system collapse from pests or climate in a monoculture system. Even if you do not care about the future of our environment, I hope that you will recognize that the environmental effects of this pollution does impact each of us our pocketbooks as we indirectly subsidize the low price of conventionally produced food by paying for environmental clean-up with the tax payer’s dollar. Of course, we also directly subsidize the low price of conventionally grown food through a variety of taxpayer-funded programs benefiting corporate mega-farms, the petroleum industry that provides the nitrogen foundation on which the mass production of monoculture depends, and the pharmaceutical industry that produces all the antibiotics needed to keep disease in check among the overcrowded and ill cared for food animal population. Speaking of antibiotics, the serious risk to human health created by our conventional practices is astounding. Research has shown us that diseases to which antibiotics are applied have the capacity to adapt and become resistant to those antibiotics. We are engaging in an arms race with nature, and the potential for the emergence of a super bug is not far-fetched science fiction. Yet the health costs do not have to depend on the potential of epidemic. We feed these animals an unnatural diet based in corn because it is cheap and abundant, and it helps them grow fat, and therefore, tasty to the American palette. It does not result in a healthy animal, however, and medical science will tell you that we, as humans, are no healthier for it either. This brings me to one very important thing that should be understood about the natural world: we are what we eat. Quite literally. The essential components of the food that we eat are taken into our system, broken down, processed, and become the actual building blocks of every part of us. So that which makes up the things we eat ultimately becomes us. My ultimate decision to be truly responsible for the full impact of my food choices is rooted in this realization. I would like to take this concept that we are what we eat a step further and I hope you will make this leap with me. I believe that we must own the moral implications of what we eat as well. 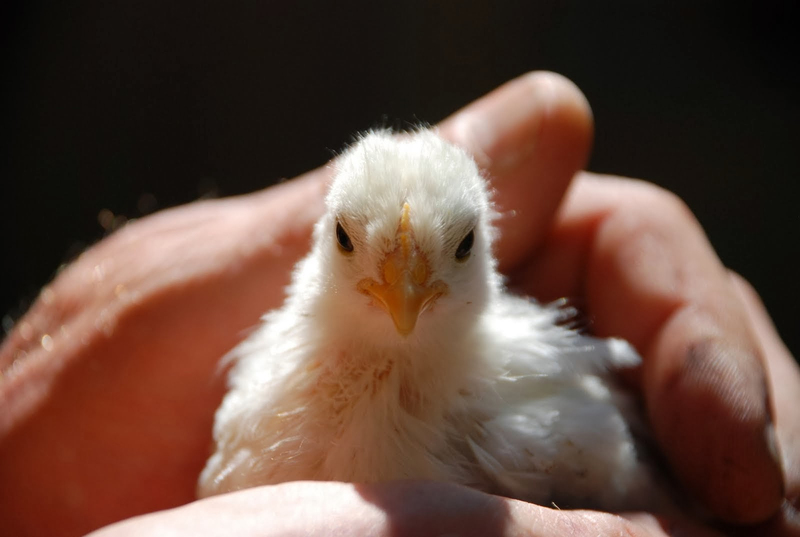 I believe that each and every animal on this planet has a consciousness of its own. That each creature experiences pain, fear, joy, and sadness. (see these happy cows) When we eat an animal, I think we take on responsibility for the life it led as we take that life and make it our own. The system that produces conventional meat for the grocery store shelves inflicts incredible neglect, pain, suffering, and fear on the animals we consume. I know that many people, if made fully conscious of the conditions of our system, will choose to become vegetarian or even vegan. I think this is a very reasonable choice, and one which I have considered. We have the wealth and capacity to make that choice a reality. I have chosen a different path, however, as I believe that death is part of the full cycle of life. I eat and I will be eaten. I believe that a consciousness of the connection of all living things through mindful eating can create a deeper understanding of one’s place in the order of things. I choose to give honor and respect to the creature whose lives I take to sustain my own, and this is why I only consume local humane and sustainable meat. Animals from small farms, living in wide open spaces, living lives free of the tortures, disease and abuse of the conventional system. I feel that I owe that kind of respect to them and to myself. We have the power of choice. With that power comes great responsibility. Is responsible, humane, and sustainably grown food more expensive then the conventional alternative? Maybe at the check out, and that is a solid maybe, but certainly not in the long run. I hope that we as a culture can begin to take this long view. I hope that we will push for conventional growers to pay the full price of their impact on the environment so that this cost will be reflected in the price of their products. I hope that consumers will look past the neat and shiny packaging to see the true contents of the processed food stuff inside. I hope that when you walk up to the meat section you will recognize that those perfect little chicken breasts came from a real live chicken, and that you will believe that the life it lived before it found it way to the grocery store shelf matters. Not just to the chicken, but to all of us.